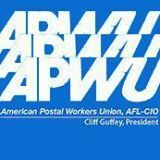 The APWU says it is the world's largest postal union, representing more than 220,000 U.S. Postal Service employees and retirees, and nearly 2,000 private-sector mail workers. "The U.S. Postal Service doesn’t run on your tax dollars. It’s funded solely by stamps and postage."